sOMEThING - Slashing the Limits of Bi-Metal Performance! sOMEThING continuously puts out some of the best playing high end yo-yos on the market, and their newest throw is no exception! This is the Slasher! 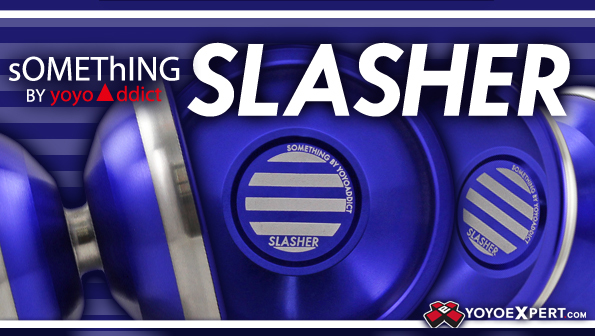 The Slasher is the newest and most unique bi-metal design from sOMEThING. It has stainless steel weight rings fitted on the outside rims rather than the inner cups like their popular Anglam. This gives them the ability to alter the weight distribution in different ways without sacrificing that high level of play you expect from sOMEThING throws. The new bi-metal design pushes the weight even further toward the rims to give you a really powerful spinning and stable yo-yo while the stepped organic profile makes the Slasher unbelievably maneuverable through any routine or complex tech combo! The Slasher is a real deal competition yo-yo, and if you're still unsure just watch Hiroyuki Suzuki's first place routine at the East Japan Yo-Yo Contest!